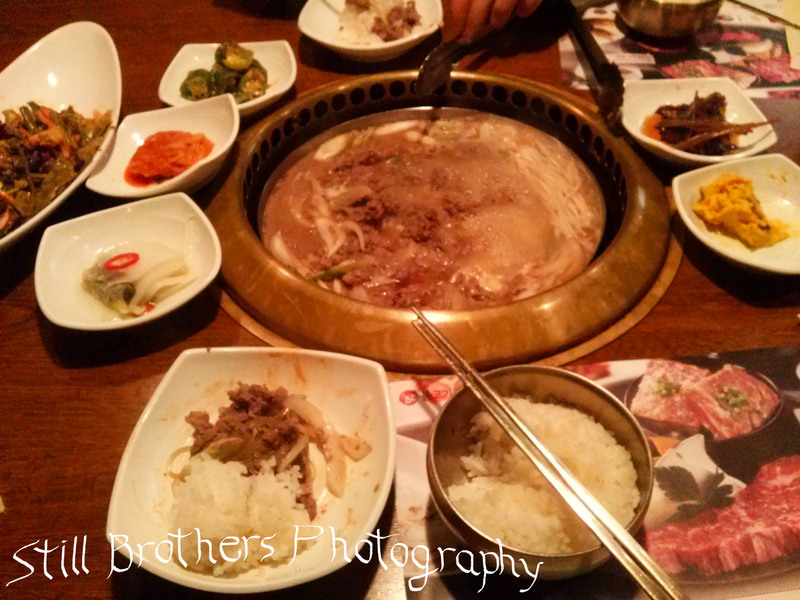 After a long day of hiking in Bukhansan Natonal Park my brother and I opted to get bulgogi for his last night in Korea. 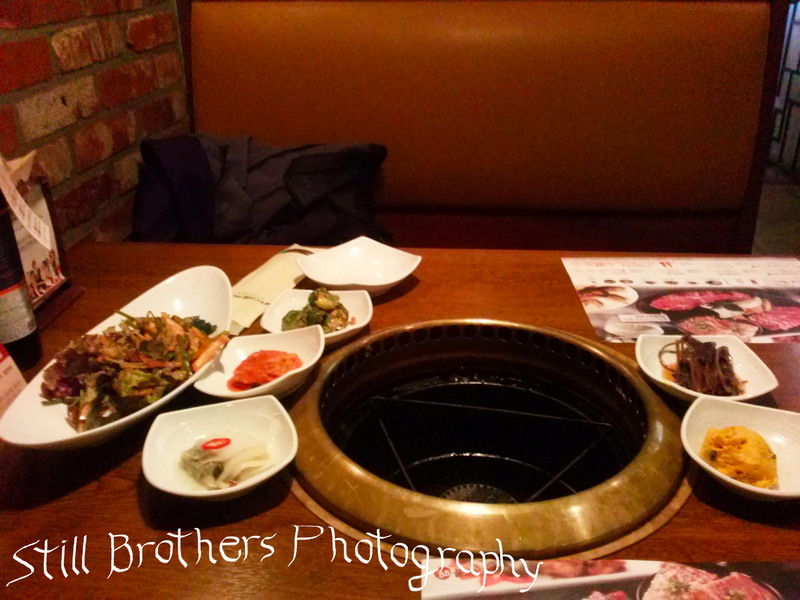 He tried many different dishes and all sorts of barbeque and easily declared bulgogi to be his favorite Korean food. 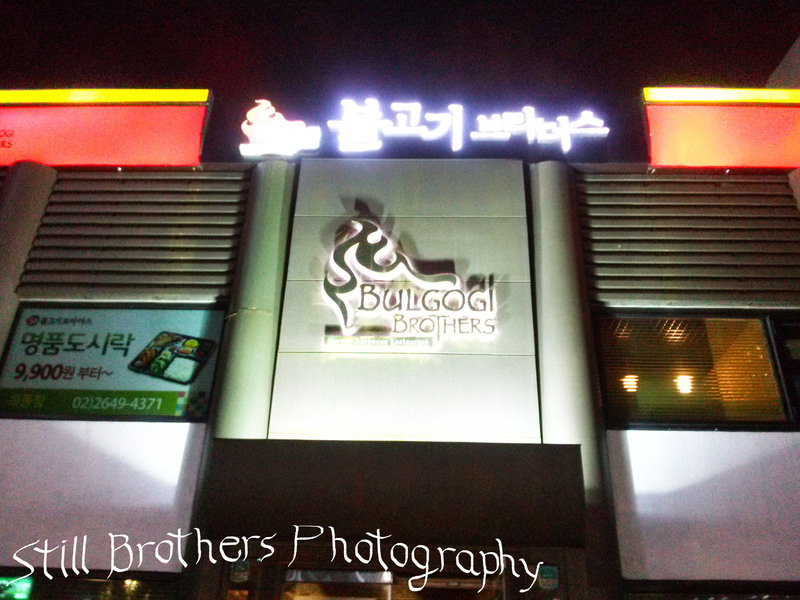 I asked my Korean friend, Sejun, for a restaurant recommendation near my house and he suggested a high end chain, Bulgogi Brothers. We took the train right there since it was on the way home and only a 5 minute walk from Mokdong station;we were seated right away. Bread and a cold tea were brought out immediately. The “bread” was warm, fresh and a nice change of pace for Korea but it tasted as if it was made with rice. It was tasty but I hesitate to call it real bread like what I’m used to in the states. The menu has pictures but unfortunately not a lot of them. They gave a general idea for what each type of meal was at the top of the page but the specific dishes below were all written. There’s an English translation but it is merely a phonetic version of the Hanguel. Luckily I have a dictionary app on my phone and we were able to pick out two bulgogi meals. The waitress kept asking fus something but we had no idea what she was saying. She covered her mouth, clearly embarrassed, and left. The banchan came almost instantly with a delicious spread that included a spicy salad, kimchi, some sort of sweet potato mash, spicy peppers, what I think was almond jelly and a seaweed dish. I really liked the salad and seaweed; the sweet potato would have been better warm but the rest wasn’t appealing to my palate. Within a few moments our entrees were brought out. 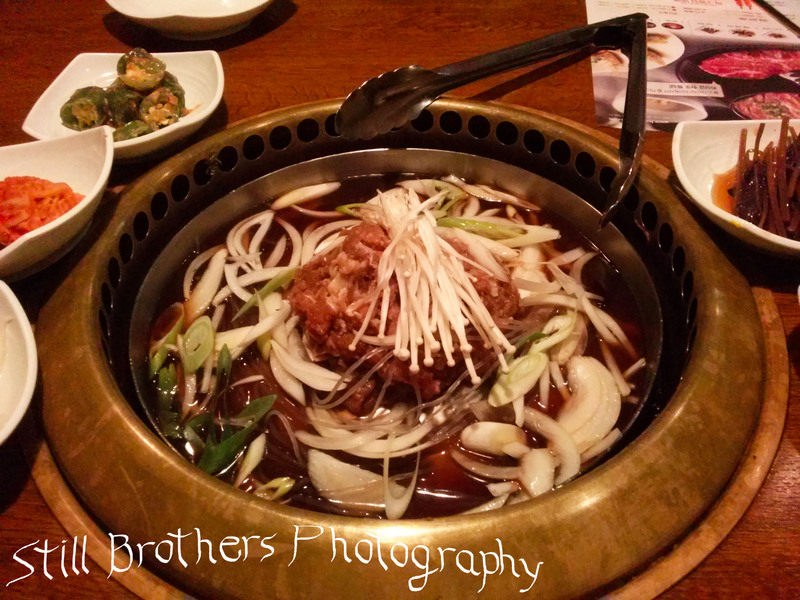 A giant pile of raw meat with mushrooms on top sat on a bed of onions in a beef broth. Our waitress laid the mix on the grill in our table and turned it up. We stared at her with confused looks unsure if we were supposed to cook it or if she would. A moment later she stirred the dish and left. We did the rest of the cooking ourselves. Ben and I had a great week together full of rivoting stories about flying, traveling & teaching. We discussed politics, religion, and caught up about girls, travel & life in general. Tonight we were discussing the upcoming holiday season and the next time we’d see each other in between stirring the dish. A few minutes later the waitress came back to tell us it was time to eat! The bulgogi was full of rich flavors and the gravy added some excitement to the white rice. Before we knew it the boiling pot was practically empty and we were left wondering if that was both of the dishes we ordered or just one. The waitress returned and we tried to ask her if that was both meals but she had no idea what we were saying. Embarrassed she came back with a complimentary coke and multiple “so sorry.” We realized that was both meals and promptly paid. On the walk home we contemplated stopping for more eats but decided to just finish off the ice cream at my apartment and throw in a few Reese’s peanut butter cups. Ben flew out the next day at midday; we had resolved to try and meet up in Australia or New Zealand next year. I doubted I’d make it back home the same time he would in the near future but if I sign a 2nd year I’ll definitely stop by home in between. As far as I can tell Ben had a great visit and helped me do a bunch of the touristy things on my list like DMZ, hike again in Bukhansan, visit the palaces & check out the Brilliant Fortress at Hwaesong Suwon.